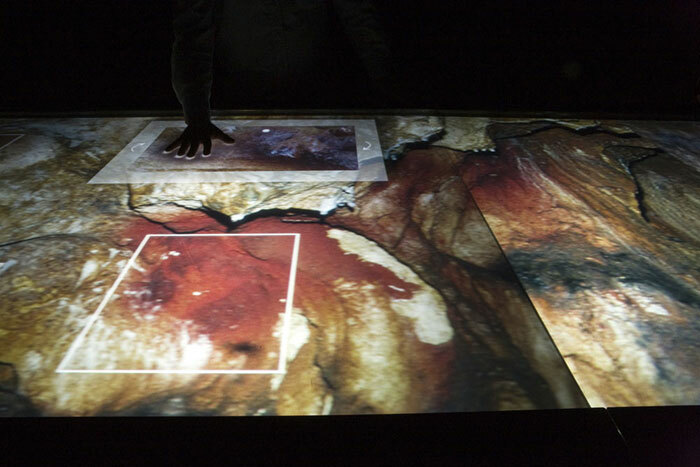 This table was created for Nestploria Center for Digital Interpretation at the Gargas Caves, one of Europe’s primary sites of prehistoric “negative hands”. Based entirely on touch, the intuitive design confronts visitors’ hands with the imprints left by prehistoric man on cave walls 27,000 years ago. Approaching negative prehistoric hands with a tactile device provided an opportunity for a particularly stimulating historical coming together. The table is treated as a “frame” that visitors can slide along a very large image of the cave walls. Doing so, they discover 16 prehistoric imprints in context. When you touch one of them, an interactive window appears: composition and application of color, technique, historical hypotheses, examination of detail with a dynamic magnifying glass. Visitors can also make their own handprint, next to the prehistoric hand. Through touch, visitors are permanently connected to the original prehistoric gesture. The device can be used by 12 people simultaneously. All images (walls, prehistoric and visitor imprints) are drawn on a 1 to 1 scale. The table’s large dimensions allow visitors to experience the real dimensions of the cave walls. These two directions – tactile exploration and a life size scale – materialize these multimillenia old imprints and allow the almost unthinkable exploration of the cave itself. Because of its very large size (4.80 x 1.20 m), this apparatus brought together a team of engineers, programmers and technicians gathered by Thierry Fournier in collaboration with the EnsadLab research laboratory from the École Nationale Supérieure des Arts Décoratifs de Paris (“Sensitive Surfaces” stream). Student: Marie-Julie Bourgeois, Anahita Hekmat, Tomek Jarolim, Antoine Villeret.